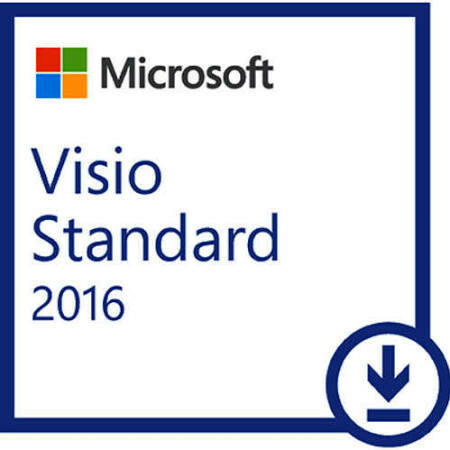 Microsoft Visio Standard 2016 provides you with the most intuitive, dynamic and smart visualization tools to take diagramming to a bold new level, and advance sharing to a more real-time and interactive experience. Transform complex ideas into "aha!" moments and get everyone on the same page with less time and effort. Create clear and attractive diagrams in minutes, with a diverse set of modern, pre-drawn shapes, pictures and templates, with an intuitive navigation and with new automatic drawing tools. Bring your diagrams and scattered islands of data together in one dynamic, data-driven picture. With modern, pre-drawn shapes, intelligent templates, and sample drawings, Visio 2016 offers a wide variety of options to meet your diagramming needs for IT, business, process management, and more. Create visual mashups using Visio Services. Publish and share visually compelling dashboards that contain interactive Visio diagrams and other application services. Visio Services and SharePoint Server integration supports visual mashups of actionable data and diagrams for an information-rich viewing experience. Find and access the tools you need quickly. Every step in creating a diagram is more intuitive, with the logical groupings of features in Ribbon tabs, an enhanced Shapes window for easy access to shapes and stencils, and a new status bar that helps you move more efficiently within and between your diagrams. NOTE: Windows XP and Vista NOT supported. This product requires Windows 7 or newer operating systems. Please NOTE: This product will require creating a Microsoft Account! This product is eligible for free shipping as a download!